(MoneyWatch) Latoya Simpson did everything right -- and paid the price. The 22-year-old was studying radiology at New York City College of Technology last year and making $13.50 an hour as a full-time cashier at Juicy Couture, in the women's apparel maker's Fifth Avenue store in midtown Manhattan. Then she said the company gave her a choice: Either make herself available to work more, which would require her to quit school, or go part-time, resulting in a big drop in pay. It wasn't that store managers wanted her to work more hours -- they just wanted her to be around in case they needed her. Unable to make ends meet on a part-timer's income, she reluctantly set aside her studies. "I felt that was unfair because when they promoted me to full-time they said it was fine for me to go to school," she said. "Then they gave me an ultimatum about dropping out of school or opening up my schedule. I had bills and rent to pay, so I kept the full-time position and stopped going to school." In March, only a few months after leaving school and after nearly four years at Juicy, she was fired for violating the company's lateness policy. Simpson's experience and that of other current and former Juicy employees typifies the squeeze faced by workers across the retail industry. Juicy, a once trendy brand that has lost allure in recent years under the management of corporate parent Fifth & Pacific (FNP), has in recent months pushed to replace higher-paid full- and part-time workers with part-time employees earning far less, they said. Workers also said managers slashed hours for more highly paid personnel, who could earn upwards of $15 an hour, even as the company hired part-timers willing to work for $9 or $10 an hour. The story is also made more complicated by politics: Several ex-employees said they were told that the retail chain was capping people's hours partly over concerns that workers might qualify for health benefits when the Affordable Care Act takes effect in 2014. "Some managers said, 'You can thank Obama for this'," said Ali Marshall, 22, a former Juicy cashier who earned $12 an hour until she was laid off in March, in relating one reason she says she was told when her hours were cut in half earlier this year. Juicy Couture denies that it has recently capped or reduced employee hours, while acknowledging that business after the holidays tends to drop off, reducing the need for seasonal workers. "Our hours for both full-time and part-time employees are consistent with comparable periods in prior years," said Jane Randel, senior vice president of corporate communications and brand services at Fifth & Pacific, in a written response to questions. "Like every other retailer, we face and respond to seasonal fluctuations." Fifth & Pacific also said that the average hourly pay rate for part-time employees has risen since last year and that it has increased the number of full-time employees, relative to part-timers, across Juicy. Last fall the company laid off more than a fifth of Juicy's workers. The company said it is studying the potential impact of the health law, known colloquially as "Obamacare," but that it has yet to discuss with managers how the company will comply with the ACA. If these employees tell the same story, it is by no means one that is unique to Juicy Couture and Fifth & Pacific. Rather, it is increasingly the norm among retailers, which employ 1 in 10 New Yorkers and 1 in 9 people nationally. For these workers, whether at industry Goliath Wal-Mart (WMT) or at direct Juicy rivals such as Banana Republic and The Gap, retail jobs typically do not offer a living wage, let alone a leg up into the middle-class. Rather, with even full-time workers struggling financially, they are far more often a pathway to poverty. 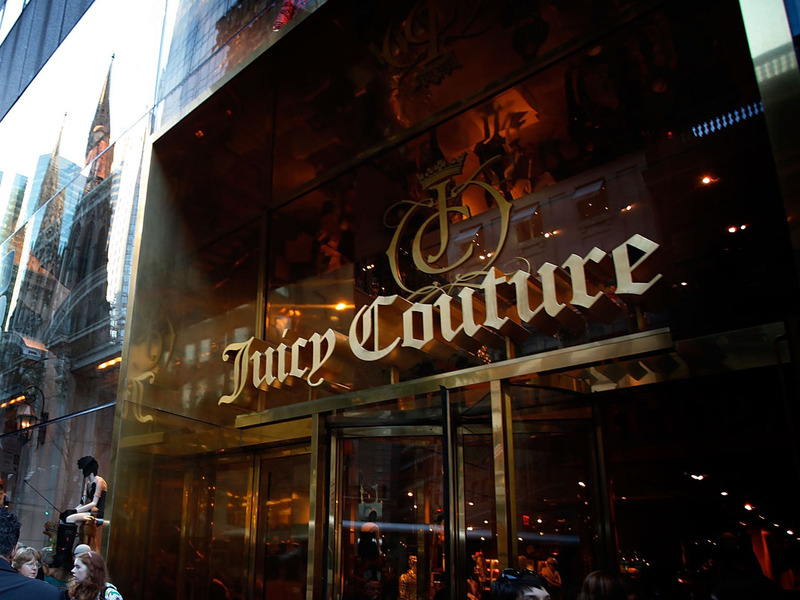 "It's not just happening at Juicy Couture -- it's widespread," said Susan Lambert, a professor of organizational theory at the University of Chicago and an expert in work-life issues. "People at the top of every company will say, 'That isn't our policy.' And of course it's not. But what happens is that firms set up incentive structures without thinking through their implications at the front lines." Retail jobs have long been lower-wage. Among full-time workers, hourly wages range from $14.42 on the high end of the scale to $9.61 for lower-paid people, according to Demos, a New York think-tank. Part-timers generally make much less, with wages of $9.61 on the high side and $8.25 on the low (see chart below). The typical retail salesperson makes $21,000 per year, while cashiers earn $18,500. But the erosion of labor protections, corporations' focus on their share price and developments in workforce management technologies are today combining to make such work increasingly precarious. Full-time jobs are being replaced by part-time positions offering diminishing hours, usually with no benefits and no paid time off. Roughly a third of U.S. retail workers typically work less than 20 hours a week, research shows, while 18 percent work less than 15. As a result, with companies employing large numbers of part-timers and hours hard to come by, workers increasingly find themselves competing not with the store down the street, but with each other. Meanwhile, the use of "flexible" labor practices is making life difficult for millions of retail and other employees. Employers are not only keeping a lid on hourly wages, but also rationing hours while requiring workers to be available to work at all hours of the day or night, on weekends and during holidays. The upshot: With the retail sector shaping up to be the second-largest provider of jobs in the U.S. over the next decade, a growing swath of America's workforce can no longer be sure from one week, day and even hour to the next when they will work or how much they will earn. Many companies use scheduling, workforce "optimization" and other software to help manage employees. What is changing is the growing adoption of so-called just-in-time and "on call" scheduling, especially in service industries, as stores seek to match the number of workers they have on the floor to business demand. Employers say the benefits are obvious: limiting employees' hours amounts to limiting payroll costs. Using metrics like floor traffic and commission figures for sales staff, such software can help companies decide when -- or if -- to schedule people. Along with calibrating staffing levels to customer flow, employers also can limit overtime and generate cost savings as business conditions change. Although the technology can run into the hundreds of thousands of dollars for larger companies, smaller firms can turn to far cheaper "on-demand" scheduling options. "A key way employers control their labor outlays is by keeping close watch on the number of hours assigned to workers," said Lambert, noting that 37 percent of retail jobs in the U.S. are now part-time. "One way they do this is by keeping headcount high. They keep lots of part-time workers on the schedule, but there aren't enough hours to spread around to make real jobs for employees." As such practices have become common among larger retailers, including at stores like Juicy Couture, workers' schedules have grown increasingly erratic. Only 17 percent of retail employees have a set schedule, while 20 percent learn their working hours with no more than three days notice, according to a 2012 study by labor experts Stephanie Luce of City University of New York and Naoki Fujita of the Retail Action Project, an advocacy group for retail workers. Some 43 percent of these employees are on call, requiring them to phone their managers to find out if they are scheduled, sometimes with as little as two hours advance notice. Fifth & Pacific said it requires managers to post schedules in advance and that it doesn't use on-call scheduling. But former employees say their hours were often changed without warning. "They would change the schedule and wouldn't even communicate that," said Duane Davis, 26, who worked in the Fifth Avenue store's stock room at Juicy for four years before leaving in February and who recently worked with the Retail Action Project to start an online petition calling for fairer treatment of Juicy employees. "You'd show up and you weren't even working the schedule that you thought you were working." Davis added that employees would often take a picture of their schedules so they could document for managers when they had been scheduled to come in. This is not unusual in retail, experts said. If customer traffic is slow, employees may be sent home upon arriving for work, or they might have to stay beyond their normal shift if business picks up. Workers may find themselves working a day shift one day and at night the next, while many are expected to be available seven days a week, according to an analysis of just-in-time scheduling by Demos. As they struggle to maintain their shifting schedule, workers are often penalized for being late or because of other unplanned absences, such as doctor's visits. "There's no predictability to their lives," said Stuart Appelbaum, president of the Retail, Wholesale and Department Store Union. "How do you arrange for child care if you don't know if you're going to be working? How do you arrange that if you want to go to school? How do you get a second job if you always have to be available?" Fifth & Pacific said it uses scheduling software to guide staffing levels. But Lambert's research raises questions about whether customer demand varies as much as retailers claim. At most stores, 80 percent of staffing hours remain consistent from month to month, she has found. That suggests scheduling requirements are, by and large, highly predictable. Still, Juicy Couture is no different than many retailers that seek to minimize labor costs by relying mostly on part-timers and by calibrating workers' hours to demand. But the unit's weak financial performance, coupled with the arrival of a new CEO in December, appears of late to have intensified its cost-cutting measures. When Fifth & Pacific, then called Liz Claiborne, bought Juicy in 2003, the brand was known mostly for its "casual luxury" line of velour hoodies and pants; today its products includes dresses, tops and other clothes along with accessories including handbags, watches and jewelry. Yet Juicy's designs failed to keep up with the times, and revenue has fallen sharply. The brand's sales sank 6 percent last year to $499 million, with net sales shrinking an additional 4 percent in the latest quarter. Overall, Fifth & Pacific lost $59 million in 2012, or 54 cents a share, on sales of $1.5 billion. Fifth & Pacific is trying to fix Juicy. Along with last year's layoffs, in December the company hired former Kenneth Cole executive Paul Blum to revitalize the brand. Those steps may be a prelude to shedding Juicy, which has 78 specialty retail and 54 outlet stores. The Wall Street Journal reported earlier this month that Fifth & Pacific was exploring a sale of Juicy and denim clothes maker Lucky Brand. That would leave Fifth & Pacific with a single major brand -- its Kate Spade line of designer clothes, bags and other goods. If just-in-time scheduling can help companies save on labor costs, such practices may hurt them in other ways. Davis, who emphasized that he once "loved working at Juicy," said the company's move to cut part-timers' hours, aggravated by scheduling snafus, left employees dispirited. That can increase employee turnover, which tops 50 percent in retail, according to industry studies. Constant staffing changes are costly and seemingly problematic for businesses that count on good customer service to drive sales. Still, how much employers care is open to question. High turnover lets employers limit other costs, such as pay raises and layoffs. Another perk as far as many companies are concerned: Employing mostly part-timers whose schedules change frequently makes it difficult for workers to unionize, said Katherine Stone, a professor of law at UCLA and an expert in employment law. If these changes in retail makes life on the job unpredictable, more certain is the adverse economic and social consequences that part-time labor and just-in-time scheduling has for employees and their families. For one, 58 percent of the jobs created since the recession officially ended four years ago have been in low-wage occupations that rely heavily on part-time workers, including retail sales, food preparation, home health and customer service, the National Employment Law Project, an advocacy group, found in a 2012 study. That, in turn, is stoking income inequality in the U.S. And notably, that trend is not only the result of long-term joblessness or soaring CEO pay. It is also a function of rising "in-job" income volatility among people at the bottom of the labor market. "It's not just unemployment -- it's that you have a job and your income is going up and down," the University of Chicago's Lambert said. Indeed, the explosion in part-time work appears to be fueling the rise in poverty that followed the housing crash. In 2011 (the last year for which figures were available), nearly one-third of working families -- meaning a household where at least one person had worked 39 weeks in the past 12 months -- were defined as low-income, according to the U.S. Census Bureau. That's up from 28 percent in 2007, while more than 1 in 10 working families were below the poverty line. Also clear is that for many wage-earners, the difference between staying afloat and sinking comes down to the number of hours they work every week. The poverty rate in 2011 for households with at least one full-time, year-round earner was 3.8 percent, according to the Census Bureau's latest Current Population Survey. But the poverty rate was more than seven times higher, at 27.4 percent, for families in which no one worked full-time but which had at least one part-time worker employed part of the year. For its part, Fifth & Pacific maintains that it wants to look out for their employees' welfare. "We are always concerned about our associates' well-being, and we would love to have so much business that we could have more hours for all our employees," Randel said. What legal protections do part-timers have as they cope with shortened schedules and the vagaries of just-in-time management? Not many. Less than 5 percent of retail workers are represented by unions. Labor laws also have not kept pace with changes in the job market. Although the Fair Labor Standards Act in 1938 established a national minimum wage and limited work hours, among other safeguards, it was created in an era when most employees worked full-time. Today, the problem for many workers isn't excessively long hours, but inadequate and unpredictable hours, along with the low and fluctuating pay that goes with it. "There needs to be wage and hour protections for part-time workers, such as posting hours in advance, minimum pay if hours are shortened or cancelled, and a minimum number of hours guaranteed per shift," Stone said, noting that countries like The Netherlands have laws that ensure parity in pay and benefits (on a pro-rated basis) for part-time and full-time workers. "There are ways for employers to fill staffing needs, even when those needs are variable, without putting all of the burden on workers." Duane Davis, a single father with a two-year-old daughter, has found another job since leaving Juicy. Yet he remains committed to pressing for change at the company. Asked what message he wants to deliver to Fifth & Pacific leaders, he said, "You've got to be fair to people. We're not asking for much. We just want more hours -- that's it. Take care of us like we take care of you. We're not asking for huge raises, just more hours. Some of us depend on it."